Raise your game to all new heights! 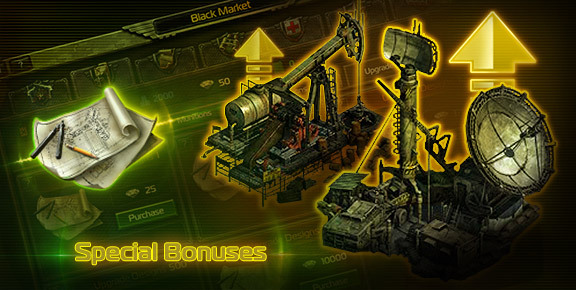 The Syndicate has just enabled Commanders to receive even greater Bonuses! Simply Upgrade your Buildings to increase your Base’s power and cause your rivals to shake in their boots! Level 25 – Max Storage Depot capacity now 500,000! Level 25 – Max Field Kitchen capacity now 500,000! Now you can Upgrade your Radar to Levels 21 and 22! Level 21 – Increased search range, accelerated Resource gathering at Repositories. Now you can Upgrade your Fuel Silo to Levels 6 and 7 to increase your Fuel production! Upgrade now and gain an advantage over your rivals in your fight to rule Zandia!